The bad blood between Khabib Nurmagomedov and Conor McGregor apparently did not get settled by Nurmagomedov’s fourth-round submission of the returning Irishman, as the UFC 229 event at T-Mobile Arena in Las Vegas was marred by post-fight altercations involving the principals, leading to Nurmagomedov not being presented with the championship belt after his first successful lightweight title defense, as he and McGregor were ushered to the locker room without hearing Bruce Buffer’s official reading of the result. At the time of the finish, Nurmagomedov led 29-27 on all three scorecards and was pulling away. But it was clear that the animosity that began with McGregor going after Nurmagomedov before UFC 223 in April wasn’t going to end with this fight, which was entertaining while it lasted. McGregor pressured Nurmagomedov at the start of the bout, and he defended the champion’s first takedown well for a while until the fight hit the deck just before one minute elapsed. McGregor stayed cool as Nurmagomedov tried to work, and the two traded strikes on the mat. As the round wore on, Nurmagomedov wore on McGregor, keeping him grounded until the end of the frame. A right hand by Nurmagomedov stunned McGregor and the crowd in the opening minute of round two and the flash knockdown led to a second takedown. This time, Nurmagomedov got into the mount, but McGregor was able to get back to the guard. That didn’t stop Nurmagomedov from pressuring McGregor, and now the heavy-handed strikes were coming from the champion with frightening accuracy. McGregor got away with an illegal knee to the head, but Nurmagomedov didn’t blink. With less than a minute to go, McGregor rose to his feet, but Nurmagomedov stayed locked on to him against the fence. McGregor smiled as the round ended, but things weren’t looking good for the Dubliner, who was bruised under the left eye. McGregor landed some strikes to open round three, and he stuffed the first takedown attempt of Nurmagomedov. The two proceeded to lock up against the fence, Nurmagomedov in control until a McGregor knee to the body broke the clinch. McGregor mixed in body shots nicely, while Nurmagomedov was surprising with his own striking. A brief trip to the mat by Nurmagomedov followed, McGregor refusing to stay down, even though he was locked up by the Dagestan native until the horn. After a good start to round four by McGregor, Nurmagomedov was able to put his foe on the mat, drawing boos from the crowd. 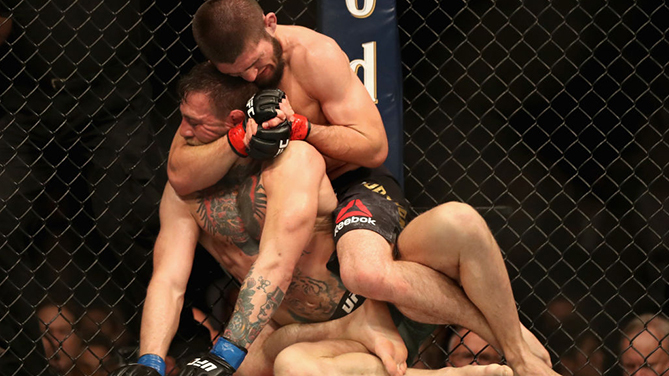 But Nurmagomedov was undaunted, and as he took McGregor’s back, he sunk in the rear naked choke that forced the Irishman to tap out at 3:03 of the fourth frame. Nurmagomedov move to 27-0. McGregor, who was in the Octagon for the first time since November 2016, falls to 21-4.